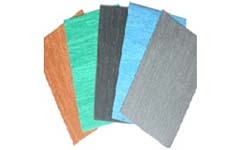 Quick Overview: Synthetic Fiber sheet is made from special Synthetic Fiber heat-resisting fiber, NBR rubber compound heating and compression molding. It eliminates asbestos rubber sheet essentially and thoroughly. * Suitable for water, high temperature steam, compressed air, joint part of tubing, valve, heat exchanger, etc. * Can be used in oil conditions. Black, black with white, blue, green with white, etc. It can be produced following your requirements.